Since leaving London and moving to Kent ten years ago, one of the biggest differences I notice is the change of season. Summer used to mean being too hot on the tube, winter meant being too hot on the tube because I had a huge coat on and no space to actually take it off. In Kent, however, when I walk downstairs in the morning, the view through the landscape window on the landing, just above where the old barn doors would have been, changes so dramatically throughout the year. Right now, I can see the fields, empty of sheep for the winter, through the almost-bare branches of the oak tree in front of the house and the brown wood of the hedgerows opposite, exposed now all the weeds have died down. Then there’s the mud (but don’t get me started on that one!). I live very close indeed to Sissinghurst Castle which is a very popular National Trust property. It’s stunning, spectacularly manicured gardens transformed originally by Vita Sackville-West and Harold Nicolson in the 1930s draw visitors from around the world. There’s also fantastic walks around the lakes and a cafe which sits at a convenient half-way point on my favourite dog walk (handy for escaping the mud!). Bizarrely though, I often overlook it, almost forget about the great facilities and events they hold actually on my doorstep. 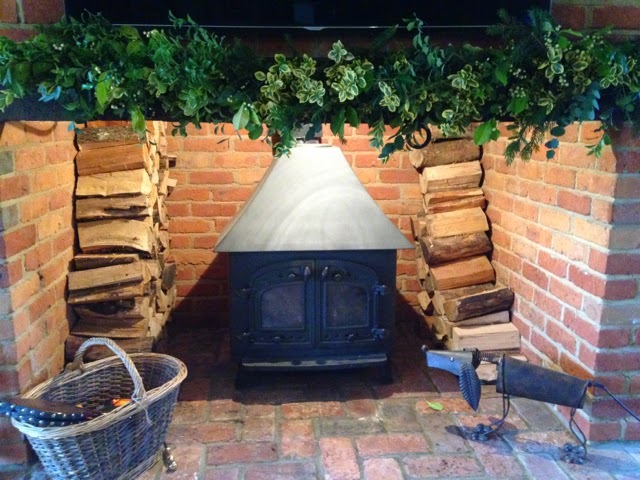 On Friday this week, my lovely friend Helen (her of the original wedding cake), booked us in for a seasonal garland workshop, run by the lovely Blooming Green, which was held in the restaurant. It’s the first thing I’ve done for ‘me’ in months and once I’ve overcome the guilt of not working/doing chores etc., I really enjoyed it. 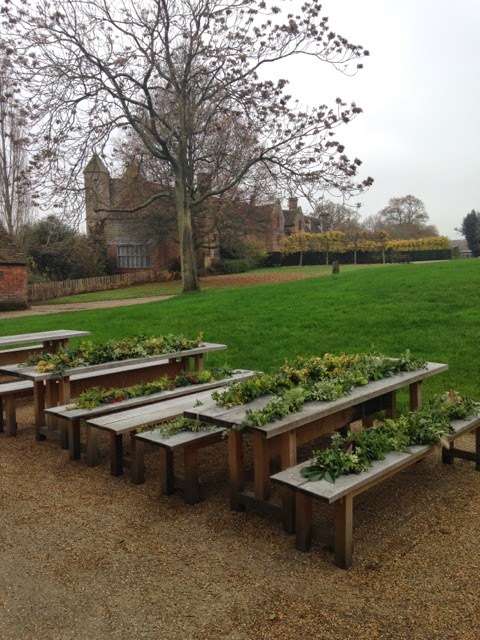 We were working with natural greenery, foliage and berries, most of which are grown organically by Bec on the Blooming Green plot in Linton, but also included some Sissinghurst rose hips. 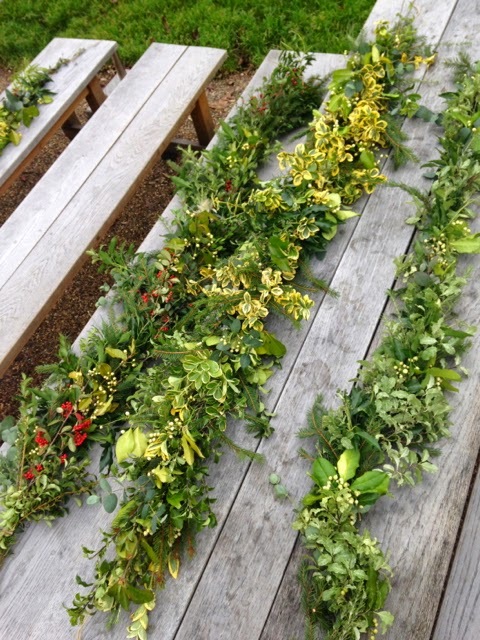 Bec (the grower) and her cousin Jen (who’s the florist) showed us how to create garlands simply using the foliage and some string, which makes them completely compostable too. Along with meeting some really interesting people (and eating someone else’s delicious cake) I came away feeling rather chuffed and just a little bit Christmassy! So as it’s almost the end of November and I think I’m finally allowed to mention the ‘C’ word, here’s my favourite Christmas cake recipe – there’s still time to make one – just pop it in an airtight container and drizzle a couple of tablespoons of brandy over it once a week between now and Christmas day to keep it extra-moist. One day before making – put the dried fruit, lemon zest, lemon juice and brandy in a tupperware box (or similar) and shake well – with the lid on! – and leave in the fridge overnight to soak. Double-line an 8″ round tin with baking parchment and tie folded newspaper around the outside with string (this helps diffuse the heat and ensure the edges don’t burn). Fold the remaining flour and ground almonds into the batter, then stir in the fruit and nuts mixture until well distributed. Spoon into the prepared tin and make a slight hollow in the centre. Bake for around 1 1/2 hours then reduce the oven temperature to 120 degrees C (gas mark 1/2) and bake for another 2 hours. You will need to check the cake occasionally, if the top looks too brown, put a circle of baking parchment on to protect it. The cake is ready when a skewer inserted in the middle comes out completely clean. Leave on a wire rack to cool – you can drizzle some more brandy over the cake whilst it’s cooling – prick the surface with a skewer first to help it absorb. To store the cake, wrap it in greaseproof paper or baking parchment (never foil as the fruit acid can attack the foil) and wrap well with cling film or place it in an airtight container. Feed your cake once a week with brandy. Happy Birthday to Meals Our Kids Love!